With the news of the character Takeshi Hongo returning to the screen in the next Taisen movie, a certain actor has taken to his blog to express his thoughts on what it means to be Kamen Rider once again. “I will be playing Kamen Rider, Takeshi Hongo, one more time. 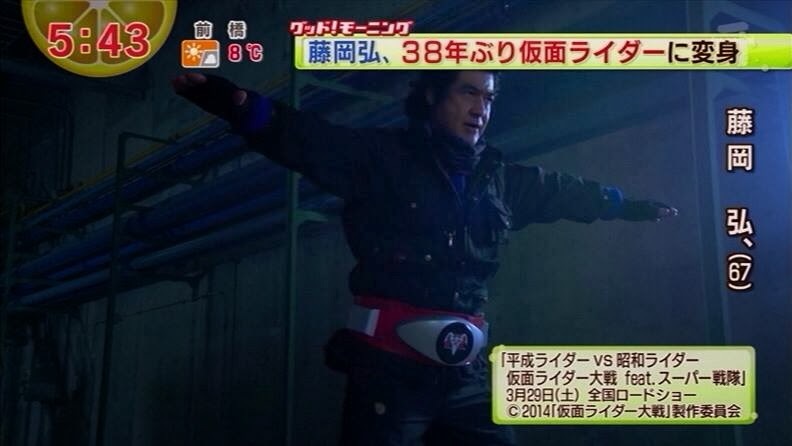 Being able to play Takeshi Hongo, who will have been fighting somewhere around the world to this day, fills me with joy and gratitude to all my seniors who built the base on which Kamen rider stands and the staff that made it all possible. Bringing back a national, worldwide known hero created by the effort of so many people, Mr. Shotaro Ishinomori being the first, I feel again the duty and responsibility of living up to the hopes and the admiration that people from inside and outside the country have felt for the hero. Why does a Rider keep fighting? What for? He is a hero that fights for peace and happiness, keeping himself unknown and disregarding his own sadness and suffering. I wish to convey this mythology through a hero movie to younger generations. I have visited nearly a hundred countries, and members of different peoples welcomed me as the “Masked Rider”. I’m proud and grateful to be a part of something that communicates an undying spirit of justice and the unwillingness to give up, and that this work has been welcomed around the world. And finally, the memory most deeply rooted in my mind will be that motorcycle incident during filming*, in which I fought for my life and was able to rise again from fear and uncertainty. The memory of that experience and the emotions I felt are something I will never forget. There will be no higher happiness for me than to be able, through this movie, to let someone feel the real hero of love and bravery and the image of a true man. I look forward to meeting you all through the silver screen. *Around the time of filming for episode eight of Kamen Rider, Hiroshi Fujioka crashed his motorcycle during a scene and shattered his leg. Without their lead actor, the show went on for a few episodes without Hongo before bringing in Takeshi Sasaki as Hayato Ichimonji/Kamen Rider 2 to replace him. But, Sasaki only agreed to do the role if Fujioka was allowed to take back his role once he had fully healed.